The Saga applies double guide posts to reduce gap opening and gap action and ensure stamping quality and service life. Slide piston of Saga isolates left-to-right movement of connect rod to ensure verticality. Bushings are welded and have the smallest clearance while guide posts symmetrically absorb thrust. Therefore, parallelism & verticality can reach JIS special grade. 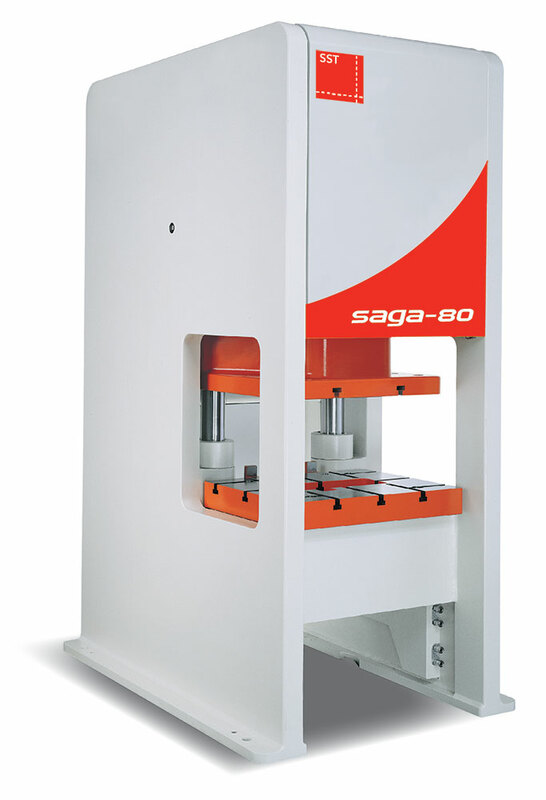 Saga applies oil layer in slide piston to ensure the press stops immediately if an overload occurs. Moreover, overload oil is released automatically to protect the press and tool from damage. Tool jam can be released easily. Because of its one-piece frame, deflection that is found in conventional Gap Frame presses is eliminated. Thereby keeping the ram parallel throughout the stroke. This improves the life of the tool compared to conventional Gap Frame presses. The shorter frame height reduces thermal deflection and is more convenient to service in the press room. The plunger isolates the slide from angular movement of the connecting rod to keep the ram more vertical. Parallelism to bolster is thereby more accurate. Rear guideposts completely absorb the eccentric load from the die. 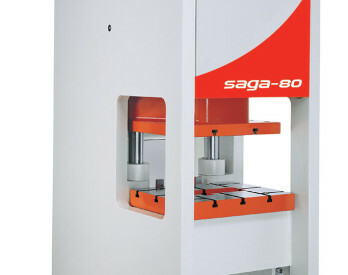 Compared with the slope center of a Gib Press which is at the center of the Gib, the slope center of the Saga Press is located at the material position which decreases the variance in the stamping process. 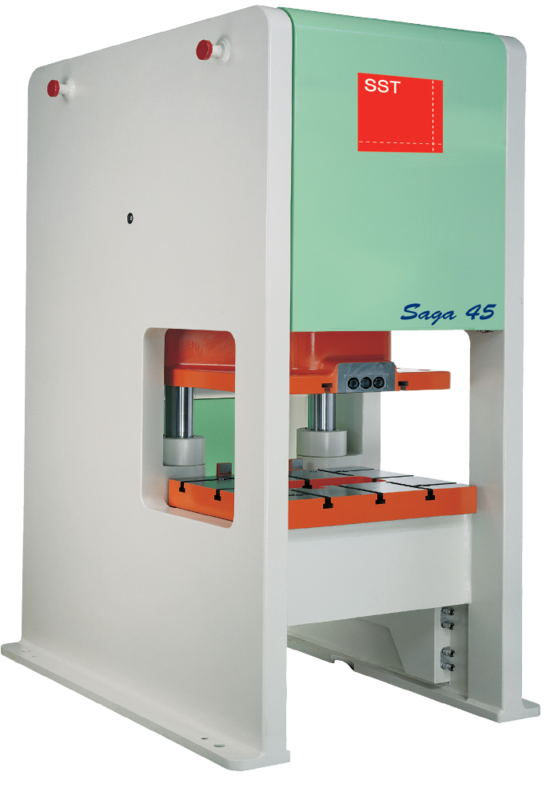 Saga presses are equipped with a Hydraulic Overload Protector. The press stops immediately in the event of an overload. The Overload device is designed into the plunger‘s structure. Oil leaks out directly when overloads occur. This stops the slide from having continued pressure on the die. Compared to the conventional Gap Frame presses, this design allows the oil to return to the reservoir. Slide decelerates from 120º to reduce immediate impact of stamping. Process time is 3 times comparable with the original crank design. Therefore, the noise and vibration of the stamping process decreases. This improves the precision of the stamping product. A remote cooling system is used to keep the lubricating oil at steady temperatures. This helps in keeping frame expansion to 0.05 mm.